What could we learn from a black boxer? The great American boxer, who has died at 74, may have been the first American black man to make the rest of us think about race in ways that didn’t frighten us, or anger us, or make us roll our eyes. Another article described it like this: In boxing terms, his success can be measured by the unprecedented three world titles he won. When it comes to racial integration, the role he played was so pivotal that it arguably blazed the trail that led to America electing its first black president. He was bold in taking a stance. He opposed the Vietnam war, which at the time was an unpopular position. Here again, he was true to what he believe and it cost him greatly. Quite likely what would have been the three best years of his boxing career. 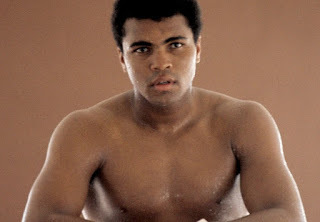 America came to see blacks differently because of Muhammad Ali. When Ali changed his name he was being true to his black heritage. Many of us did not understand it. But the reason was, he had pride in being what he was. Let that sink in. Understand, that attitudes can be changed by our actions. Being a role model and being bold can accomplish change. 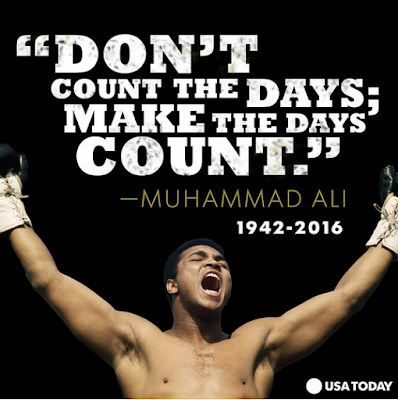 Like Muhammad Ali, let us show we are not ashamed of what and who we are.